New York (Tadias) – President Barack Obama hosted a large contingent of young African leaders from the public and private sectors at the White House on Tuesday. 115 young leaders representing more than 40 countries – including Ethiopia – gathered for the East Room event, where the President led a town hall meeting urging the attendees to focus on economic progress, fighting corruption, disease and extremism on the continent. The young leaders were joined by a number of U.S. administration officials, including Attorney General Eric Holder, Commerce Secretary Gary Locke, U.S. Trade Rep. Ron Kirk and USAID Administrator Rajiv Shah and others. In addition to the town hall meeting, the three-day forum features small-group discussions on topics such as transparency and accountability, job creation and entrepreneurship, rights advocacy, and the use of technology to empower individuals and communities. Per the U.S. Embassy in Addis Ababa, four young people represented Ethiopia at the forum, including Mahlet Eyassu Melkie, 29, a climate change activist; Meron Getnet Hailegiorgis, 27, an author; Salsawit Tsega Ketema, 30, Founder of Sel Art Gallery and Yohannes Mezgebe Abay, 35, Vice President of the Pan African Youth Union. The young African leaders came at the right time to the White House; at the same time they will celebrate President’s Birthday. Just wanted to say what a privilege it was to attend. Truly energizing! Barack Obama sounded like Emperor Haile Selassie during his speech. 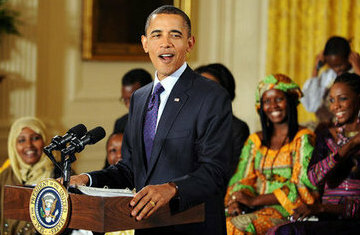 Several things that he said mirror H.I.M speeches on African progress. A most profound moment in history. I do think OBAMA’s meeting is coming at a good time when we need to start building true future leaders. I would like to participate in upcoming forums.